Thanks to some progressive urban policies coming out of the governor’s office, Los Angeles is reimagining itself as a more traditional, walkable city with a vibrant downtown business district. And, iconic Latino / Irish actor Anthony Quinn will metaphorically witness its ongoing transformation. A giant likeness of the trailblazing star, who passed away in 2001, will be standing tall and proud on the wall of the Victor Clothing Co. building at 241 S. Broadway as the surrounding Downtown area springs back to life under current Mayor Garcetti. The portrait has undertaken a restoration of Quinn’s faded likeness in collaboration with its original muralist Eloy Torrez as a part of an collaborative effort to reinvigorate the city’s struggling downtown. Born Antonio Rodolfo Quinn Oaxaca in Chihuahua in 1915, Quinn was raised in El Paso, TX and Echo Park, CA. He scored some secondary roles as gangsters and Indians in a number of Hollywood productions throughout the 1930s. It was his role opposite Marlon Brando in Elia Kazan’s Viva Zapata! where he earned the first of two Oscars, and secured his place in the Hollywood pantheon. He became the second Latino actor to pick up a statuette; the first being Jose Ferrer. To this day, he is considered one of the great actors of Hollywood’s Golden Age. 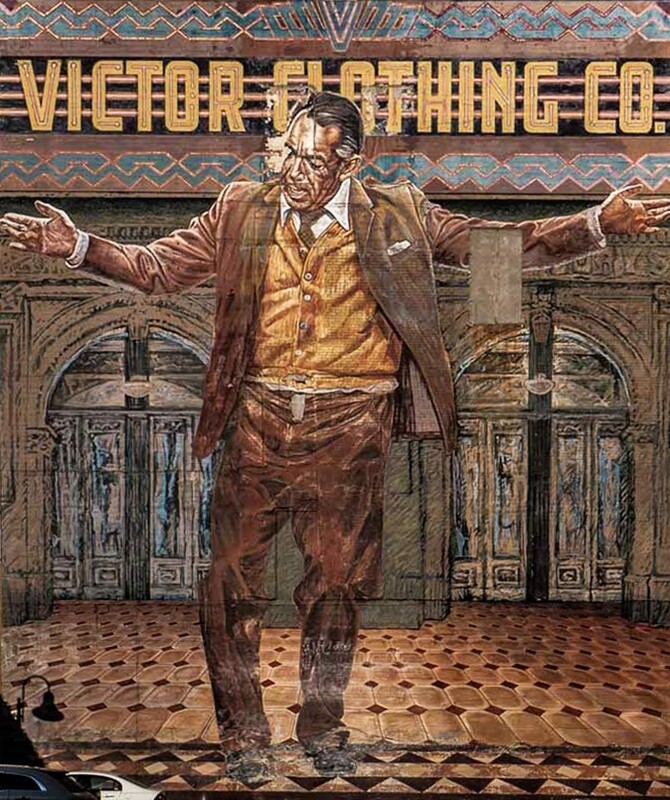 The mural itself, capturing Anthony dancing in a moment of joyous abandon, recalls an iconic scene from Zorba the Greek in which Quinn’s eponymous character dances quite exuberantly. His performance garnered yet another Academy Awards nomination. Now, Anthony Quinn’s legacy will stand tall in the middle of Downtown, Los Angeles. This entry was posted on Wednesday, January 28th, 2015 at 7:49 pm	and is filed under Blog by Manny Pacheco. You can follow any comments to this post through the RSS 2.0 feed. Responses are currently closed, but you can trackback from your own site.